FEBRUARY 2015 RETAILOBSERVER.COM 61 This blanket is one of the ways the American Red Cross brings help and hope to people across the country who've experienced disasters, every eight minutes, every day, all year long. We couldn't do it without you. 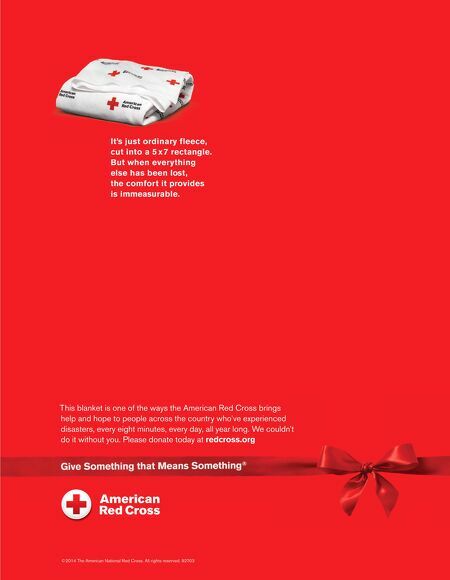 Please donate today at redcross.org ©2014 The American National Red Cross. All rights reserved. 92703 It's just ordinary fleece, cut into a 5 x 7 rectangle. But when everything else has been lost, the comfort it provides is immeasurable.